The final mix is where Justin and I run the film together doing our rides at the same time. It wont be a polished run at all, and we get an idea of what the other persons moves are and how the scene is shaped. It is very important to realise that you have to trust your instinct. Many times, the first ride that I do is roughly close to what I want to achieve but I dont spend a lot of time to get there. I can achieve that later while polishing the mix. The first pass is where all of our premixes are laid up and run. We don’t stop at what is wrong or right and correct it there. We do our rides as we decide to approach the scenes. Then both of us get an idea of what each other has in mind and what needs to be worked out. After that, we go into it scene by scene fixing the music dialogues and effects. Justin takes care of the score and dialogue then and I would handle the FX, Ambience and Foley. The whole movie has a lot of detailing and we went to the extent of adding quite some easter eggs for people who want to hear and find out. The benefit of having two mixers is that there are very different approaches that we take as individuals to a scene or emotion. For example, Justin is a more soothing and smooth mixer whose fader rides are very subtle, while I on the other hand like to keep things real and raw even on the rides. I like to make it non linear where it demands. 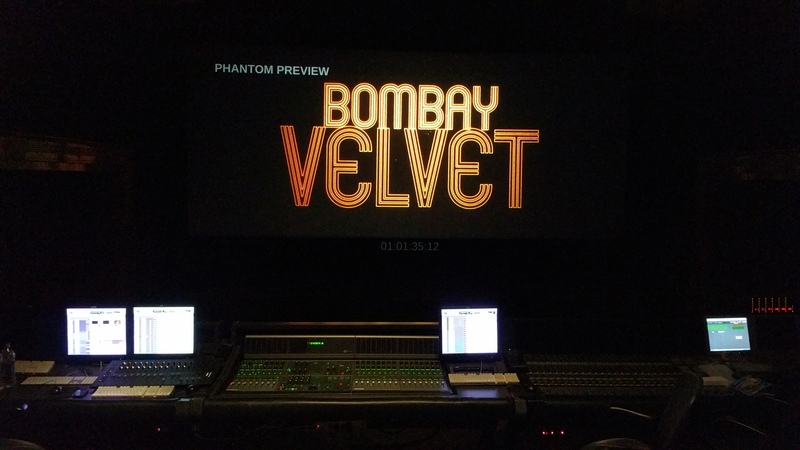 But the beauty of this is that this movie will get a benefit of having very radical mixes for scenes and it helps both of us and Kunal to get what he wants. He wants a particular emotion or approach and we treat it in our own way but with me on one side and Justin on the other without clashing into each other. This is a beautiful way to work and it doesnt tire you. In fact when we mix, we constantly ask each other on the opinion of our moves as then that is a fresher perspective. So, I would comment on the music and dialogue rides while he would comment on the effects ride. It is at this stage where we also get into a lot of design changes as the tone of the mix will be more clearer now. When I say tone, I dont mean EQ or dialogues. But what we are creating for the audience. For example, one thing we did is to drop music to create anticipation or drop effects for the same. The advantage is if we then want to take the audience into an uncomfortable or expected stage, we just do this. Psychologically the audience is ready for this then. I have always maintained that a good mixer should have a good amount of editing skills. Now, this is just my personal opinion and I will say why. If I want to achieve something that I have in my head, I know what to do with the tracks I have or if I am not having the required elements within. As a mixer, it is very important to realize that you dont necessarily need to make the audience hear every sound that is there within the track. Kunal understands this well. So, if something is low or masked by some other sound, we just mute it rather than lowering it. It makes no sense to have that playing if it cant be heard. Similarly, it isnt necessary to have the sound of everything that is on screen to be heard. It depends on what is the required emotion needed. If it is a busy street but we are staying with the character, then the business of the street can be present but it isnt necessary to hear everything that we see on screen. Remember even when we are walking or talking in a busy place, we dont listen to everything around us, yet we can hear the person we are talking to. This is a very important aspect to understand because anything and everything will be picked up by the mic and our ear. Our brain decides what to concentrate on. This is the pattern we followed on this movie. But that is not all. We have also worked a lot to set a pattern and then break it. This is a very important way by which one can create dynamic range. This is also why this phase is very strainful and can have a lot of stress. It is being deeply involved with whats on screen, whats the sound, whats that you want to achieve, how do you want to achieve, what is right what is wrong, what can be better what is the edit, why was this edit etc all at the same time. None of this is a conscious decision. It comes only by being associated with films and by starting off as an assistant and learning whatever is being thrown at you. The importance of having been there can never be understated. This is a question that I have been asked a few times. In the music industry and the broadcast world we have the R-128 or the ITU-BS-1770 and the variants for measuring loudness. They are very much needed in todays loudness wars in that industry too. But the same also happens in movies. It is a common fear for Mix engineers that the projectionist will lower the mix and the same for the Projectionist. One thing that happens is that the mixes will get louder and the projection will get softer. What can be done in such a case? One thing I have seen is that controlling the mids will give a lot of power and also helps cut dialogues through cleanly. When something is supposed to be loud, it is for the power and not for the level. Because when you are looking at the screen there is no level meter, just what you feel and hear. What is termed or felt as power is the lower mids and lows. So in fact taking off the highs will get the audience to fill that missing elements if the attack is left in. Another technique we have used in the mix is kind of like a fill-in-the-blanks. We build the spectrum with more frequency elements of the one we want to remove. For example, if it is an explosion, the score will have that element of highs or brightness in it for an extended period before it. What happens is that the mind will automatically mask it off. Its like a blind spot. Once you reach that point, then the next sound you introduce need not have that frequency as the mind will cover and make up for that missing piece. This means you can have a cleaner and bigger sound without being harsh on the ears. Ofcourse then managing this across the channels and speaker will take time and is something that one will have to do only by thinking over it and making sure that the right notes are hit. This is where I said that as a mixer, you need to know if you have all the elements or no. If it is less then you need to know what is needed or how you rearrange the tracks and elements to make it sound good. Because lets be real. At the end of the day, the audience isnt going to comment on the bird tweet you put in a scene but rather on the emotional value of the scene which would have been lost if something as simple as the bird tweet wasnt there. Both of us use the metering of the DMU (Dolby Mastering unit) for the levels and peaks. While it is useful to have a PPM metering, we are used to VU on this and helps us to set the dialogue levels on an average. What is an optimal level? If the dialogues are between +12 and +6 on this scale, then it is ok. Anything below this will only be useful in scenes and not if it is consistent. Once the dialogue levels are taken care of, everything else rides around it. During the Mastering process when the final is being made, we look at the LEQ values. This is an averaging loudness for the program. Trailers are fixed to be 85. A film usually cannot contain a whole LEQ level because reels can be extremely dynamic. Yet, it is a responsibility to have a proper listening level so that the audience is not blanketed with sound and they are not fatigued. Let me tell you something that I have experienced on this project. An atmos mix wont take considerably longer time than a regular mix. The thing is that pans and resolution changes in Atmos compared to a traditional mix. What changes is for the mix engineer to set up his master faders and prepping the tracks so that the mix is achieved in the smoothest way. Thats it. Once the pans and overheads are placed, then the mix is not different from a traditional mix in terms of the philosophy or techniques. This is also why I am now fully convinced that getting a 5.1 or 7.1 downmix from an atmos mix will give you an unbelievable result and I can personally say that it is impossible to achieve that 5.1 mix on its own. Maybe you can but that would take considerable time to get to at which point one will lose all objectivity of the mix. So, even if the mix isnt releasing in atmos, I would suggest doing it in atmos and taking the down render. The way it handles a pan across the surrounds in 5.1 is pure magic for me and is really something I look forward to in the future too. Mastering and DCP for atmos will be next. Till then enjoy!